Welcome back! 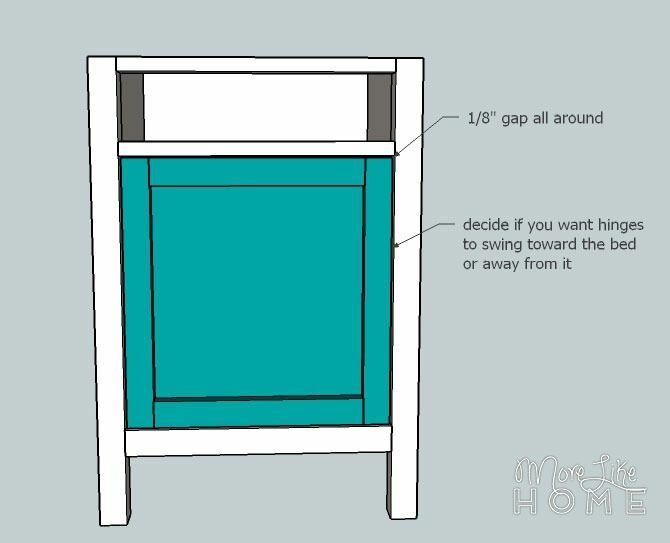 We're on day eight of our DIY nightstand series. You can see the entire series here. Most of our projects so far have been leaned toward a simple, modern style so today we are mixing it up with a good old classic. 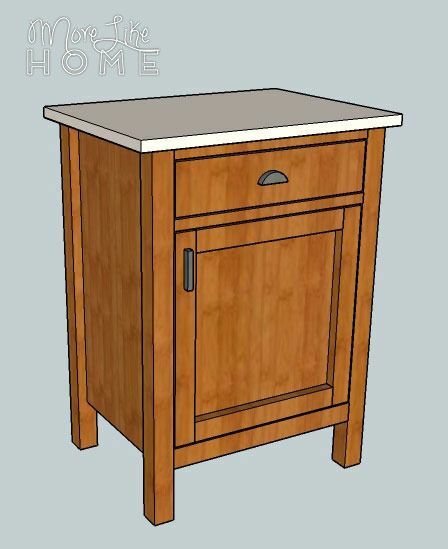 This classic style features both a drawer and a cupboard for maximum hidden storage. 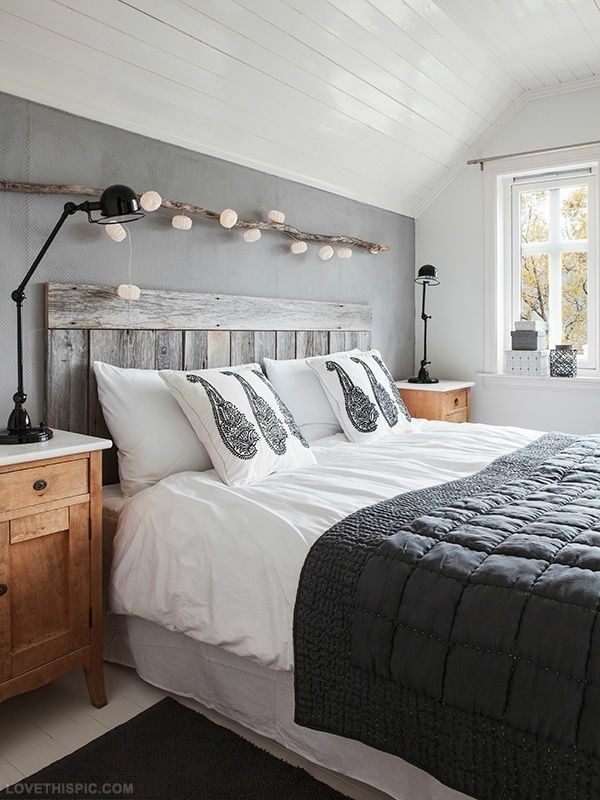 With a good distressed finish it can look like it came straight out of the antique store! Finished dimensions are 20" wide x 26 3/4" tall x 15" deep. You can start by tapering the bottom of each leg (if you want to). Measure up 3" on one side and make a mark, then 3/4" in at the bottom. Connect the marks and cut along the line. Make sure as you're building that the tapers point in toward the center. Attach a leg (A) to each side of the back board (B). 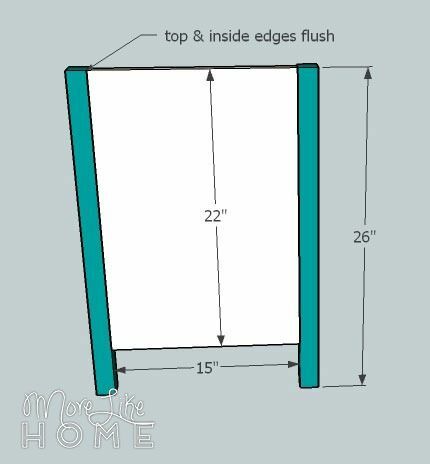 The top and inside edges should be flush. Use a Kreg Jig or drill through the legs into the back board with 2" screws. Attach the side boards (C). They should be flush with the top and inside edges of the back legs. 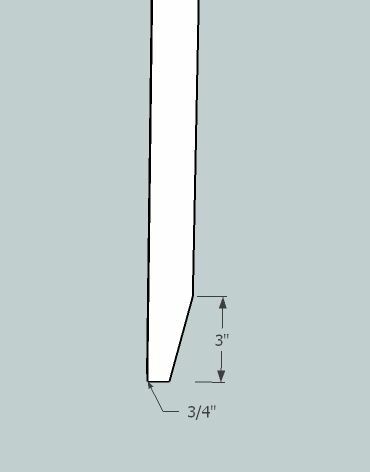 Use a Kreg Jig or drill through the legs into the sides with 2" screws. Attach front legs (A) the same way, keeping them flush with the top and inside edges of the legs. Attach the drawer trim boards (D). One should be flush with the top of the legs and the other should be set down 3 3/4". Use Kreg Jig or drill through the legs into the trim boards with 2" nails. Attach the bottom trim (E) the same way. It should be set up 4" from the bottom and sit flush with the front of the legs. There are a couple ways to attach the bottom shelf (F). 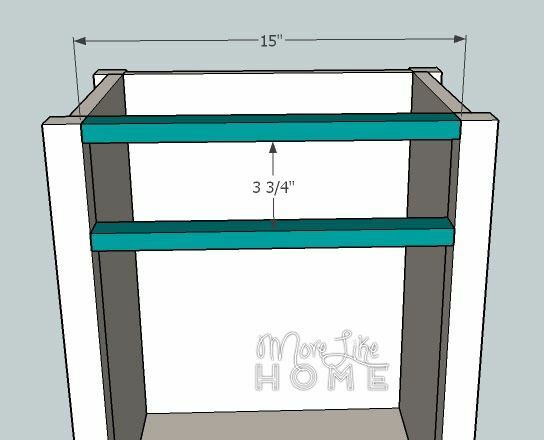 You can cut strips of 1x2 or a narrow molding and attach them along the sides of the cabinet for the shelf to rest on. 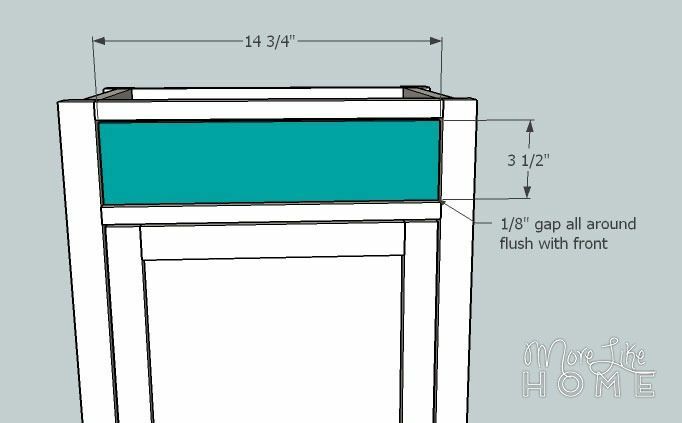 The easiest option would be installing the drawer from underneath with a Kreg Jig, keeping it flush with the top of the bottom trim. You could also drill through the sides and back of the cabinet into the edges of the shelf to attach it. Whichever method you choose, this is also a great time to add a second shelf in the cabinet if you like! 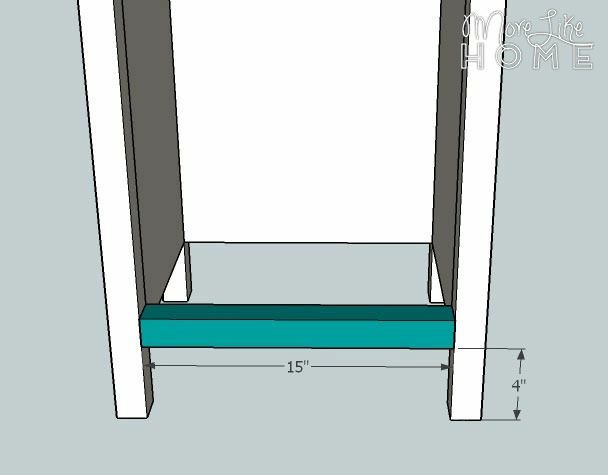 Next build the door (double check the size of your opening first, you want your door to be 1/4" shorter and narrower than the opening. Also check the directions with your hinges because they may need a different allowance.). 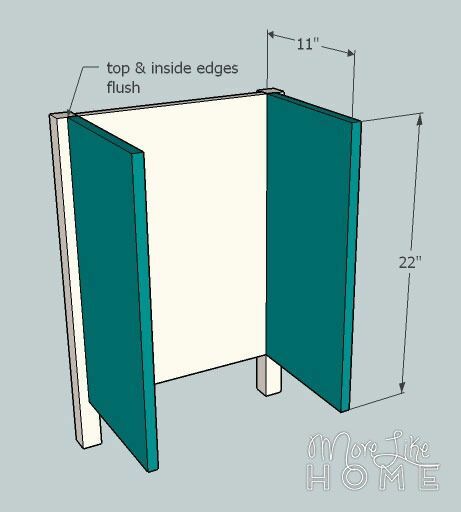 Start by attaching a side trim (H) along each side of the door (G). Keep the top, bottom, and sides flush. Attach using glue and finishing nails. 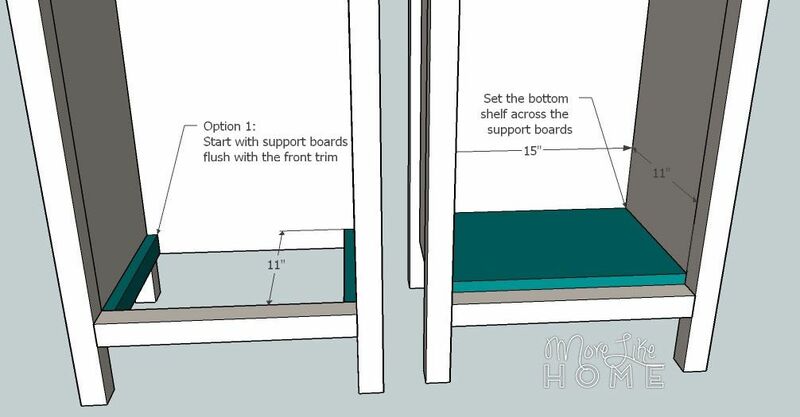 Then slip the top/bottom trim boards (I) in between the side trim and line them up flush with the top and bottom. Attach with finishing nails and glue. Follow the directions on your hinges to install the door. 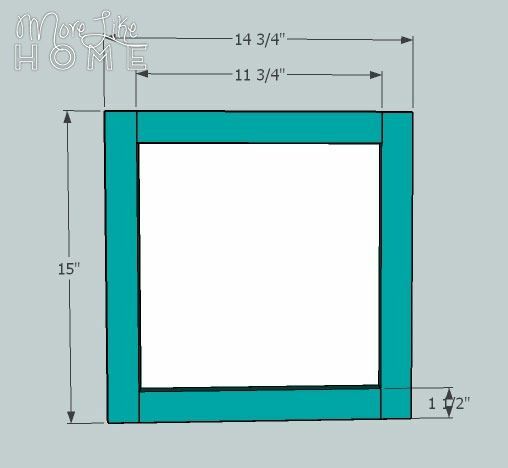 It should be centered with a 1/8" gap all around (unless you hinges specify something different). Remember to think about which way you want the door swinging relative to your bed! 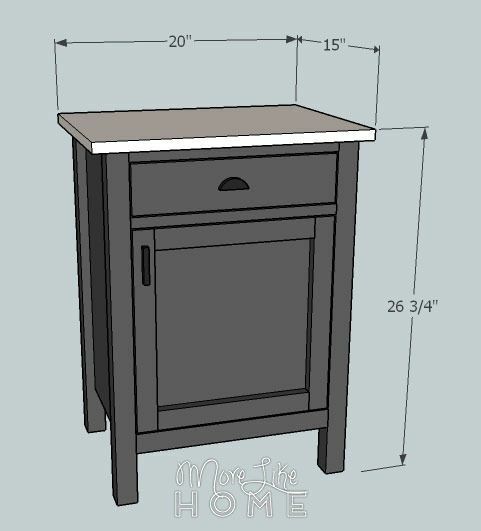 Next build the drawer box. 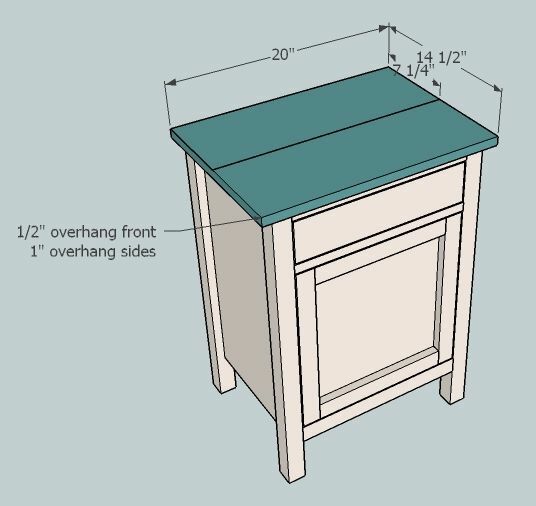 Start by attaching the drawer back (K) to the drawer bottom (J). 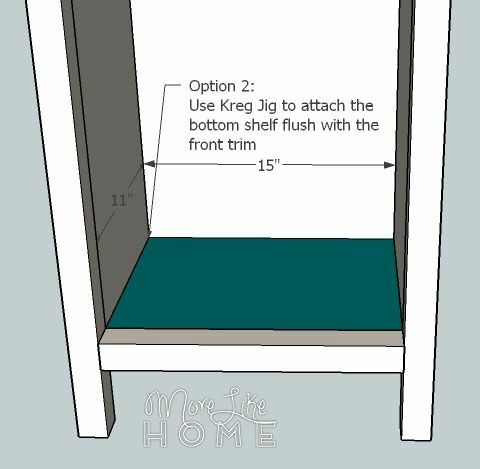 Use a Kreg Jig or drill through the the back into the bottom. Then attach the drawer sides (L) in the same way, making sure you keep all the edges flush. Follow the instructions on the drawer slides to install the drawer box. 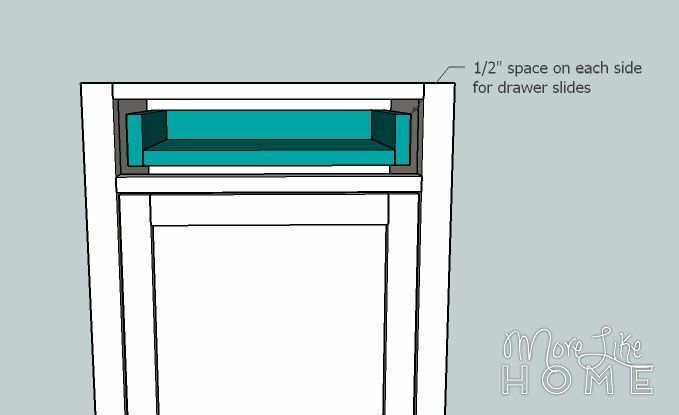 Make sure the box is recessed 3/4" from the face of the cabinet so your drawer front will end up flush in the next step. Set the drawer front in place, centering it with 1/8" gap all around. 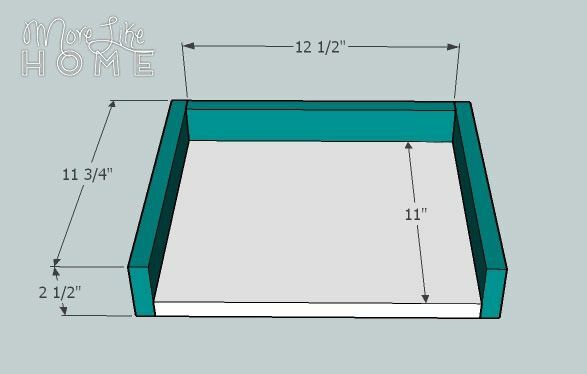 Use finishing nails and glue to attach it to the drawer box. Finally you can attach the top. 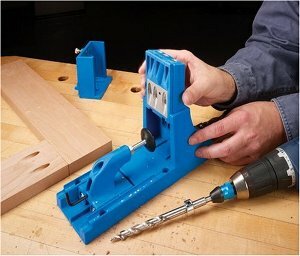 You can use a Kreg Jig to attach the boards side by side first, or install them individually. Line up the top boards flush with the back of the cabinet, leaving a 1/2" overhand in the front and 1" overhang on each side. 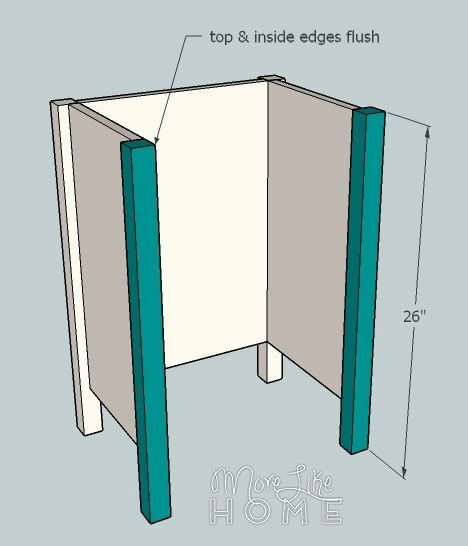 Attach it from underneath with a Kreg Jig, or by screwing or nailing down through the top into the sides and legs. The building is done, now you just have to finish it! Start by filling any holes with wood filler. Let it dry, then sand it smooth (repeat if necessary). Then sand the whole table smooth for a great finished product (a good sanding can be the difference between looking professional vs. crafty). Then finish with any paint or stain and polyurethane you like. I love the look of stain on bottom with a white painted top! 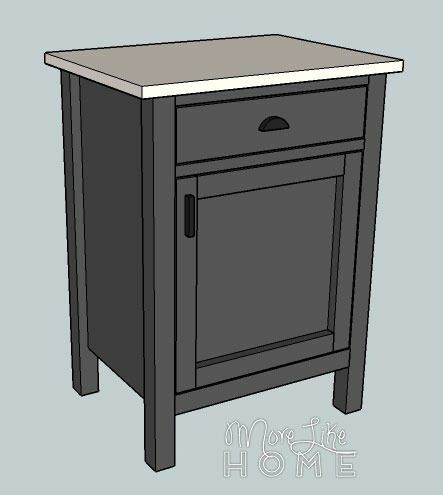 Or you could do a deep gray on the bottom for a more modern twist on a classic cupboard. 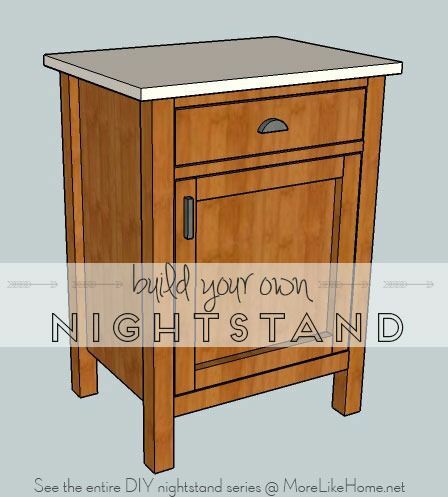 We still have 10 more days of DIY nightstand coming up! What is your favorite so far? <3 your attention to details! 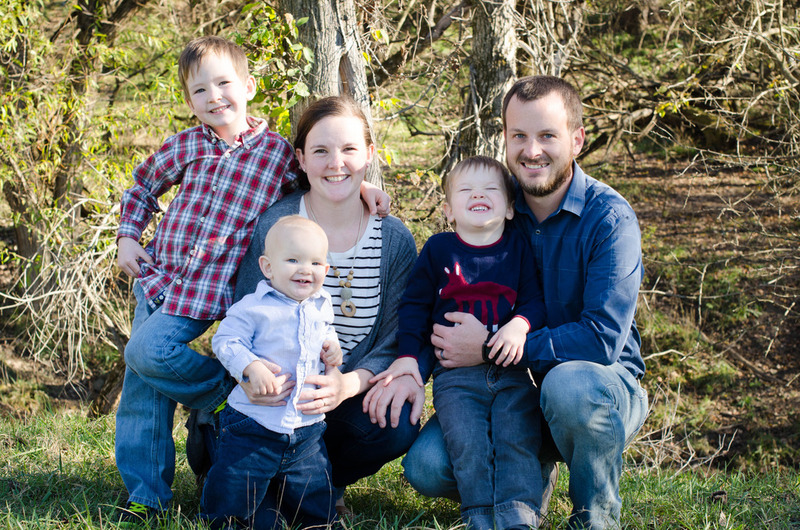 looking forward to your next post. Thanks! :) Hope you enjoy the rest of the series!